Keen Eye Prevents the Pok�mon from losing accuracy. This Pokemon cannot have its Accuracy lowered. Rain Dish* The Pok�mon gradually recovers HP in rain. This Pokemon regains 1/16 its max HP every turn during Rain Dance. FireRed It is a flying transporter that carries small POK�MON in its beak. It bobs on the waves to rest its wings. Leaf Green It is a flying transporter that carries small POK�MON in its beak. It bobs on the waves to rest its wings. Diamond/Pearl It acts as a delivery service by carrying small Pok�mon in its bill. It bobs on the waves to rest. Platinum It is a messenger of the skies, carrying small Pok�mon and eggs to safety in its bill. Heart Gold It protects its young in its beak. It bobs on waves, resting on them on days when the waters are calm. Soul Silver It protects its young in its beak. It bobs on waves, resting on them on days when the waters are calm. Black It is a messenger of the skies, carrying small Pok�mon and eggs to safety in its bill. 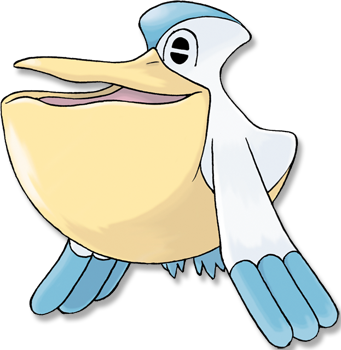 White It is a messenger of the skies, carrying small Pok�mon and eggs to safety in its bill.